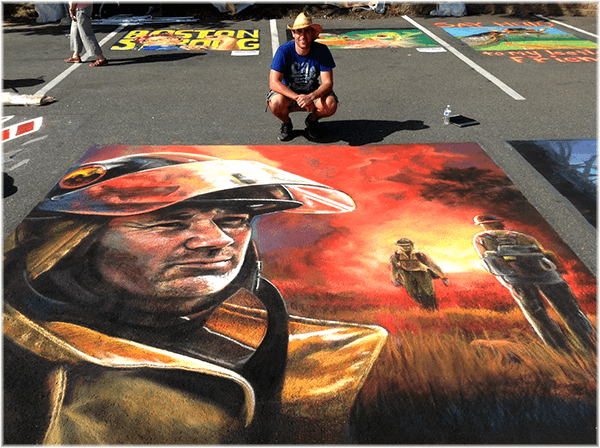 On a street in New Paltz, NY, during the Second Annual Hudson Valley Chalk Festival held July 12-14th, Street Painting Artist Nate Baranowski created a 12 ft. x 12 ft. tribute to heroes. Nate has no relation to first responders with the exception of a family friend, and has never responded to a call. He was inspired to do a "more meaningful, more touching” piece for this festival, and decided that he was going to capture a hero. Street Painting Artists attend festivals and gather to create their pieces because they have something to say, art "for the people.” Nate has been a street painter for four years, and because their medium is not permanent, the art is not meant to be sold, but rather meant to make people smile. There are competitive events, where artists may win prize money, but the Hudson Valley Chalk Festival is an exhibition. Travel is sponsored, but otherwise, artists meet to share their creations with the people purely for the love of art. Nate traveled from Tampa, FL to participate in this event. "Firefighters seem like one big community, a family, and rather than play on the emotions of sadness I wanted to show a steady, firm expression.” This firefighter is representative of the entire community. The other two figures on the right and the shield on the helmets came from photos Nate found after the Yarnell Fire. 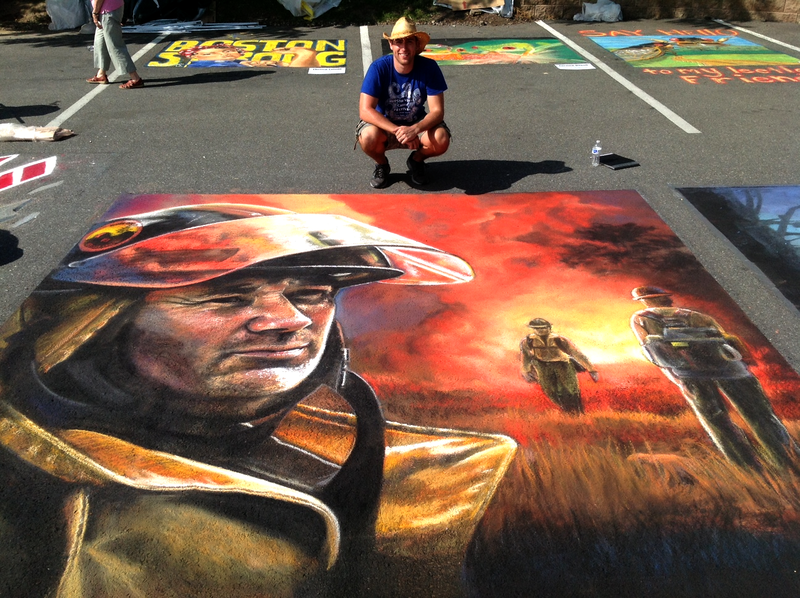 He is careful to note that this work is not to "capitalize on tragedy” but to rather inspire people and show the strength of the firefighting community. "The purpose of a firefighter is clear, and it is honorable. It is sad to me that we give attention to everyday heroes only when a tragedy strikes. I have no danger in my job. It was an honor to do the piece.” The mural has gone viral on Facebook. His original post was made before he ever left NY. Immediately the photos were shared, and the thanks rolled in. Nate and his wife have been deeply moved by the attention and comments that have followed his Facebook post of the work. “I don’t know these people, but the posts have been amazing. I didn’t expect this much impact.” Nate also gives credit to an artist friend from Chicago, Michael Schumann who helped him on this piece at the festival. Looking for a larger version? Click here.